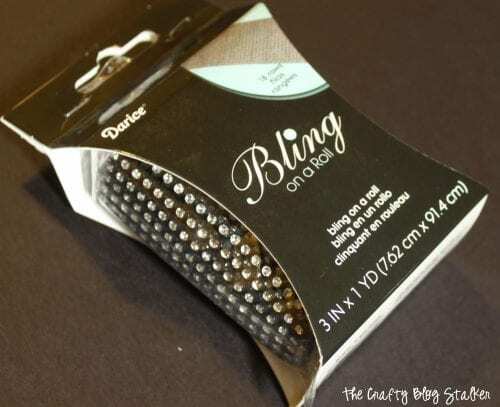 Learn How to add some bling to your jeans with Darice Bling on a Roll. An easy DIY craft tutorial idea to create your own style and fashion. This is a sponsored post on behalf of Darice and some products received were given for that purpose. All opinions are 100% mine. Last week my husband took our daughter Allie shopping, just the two of them. Isn’t that so cute?! While they were out they found these super cute jeans that were on clearance. Originally $24 down to $4. SCORE! The jeans fit her really good everywhere but in the length, they were too long. On Pinterest, I found a tutorial on how to shorten pants while keeping the original bottom hem by Just Sweet & Simple. It is a great tutorial. Very easy to follow with lots of pictures, and it helped me take the jeans from long to just right! Isn’t that is much better? But… There is even more that I want to do with these jeans, they need some bling too! 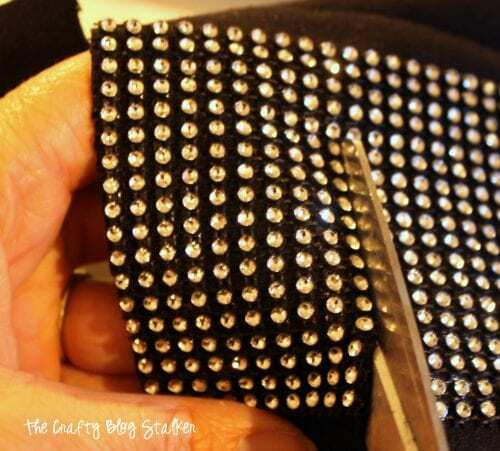 Begin by sewing the Bling on a Roll onto a strip of black fabric. Set the sewing machine needle to go in between the rows of gems. My daughter tried the jeans on and with a marker marked where I wanted the holes/gems to be. Take the strip of fabric with the Bling on a Roll sewn on and cut off a small square. Mine was about 2 by 3 inches. 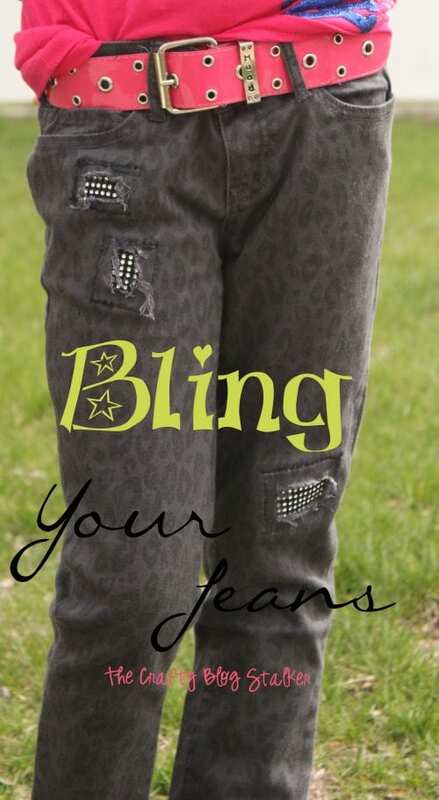 Pin the square of Bling to the inside of the pants with the bling side touching the wrong side of the jeans. 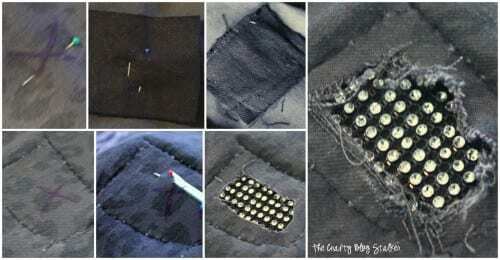 Turn the pants inside out and sew around the edges of the bling patch. 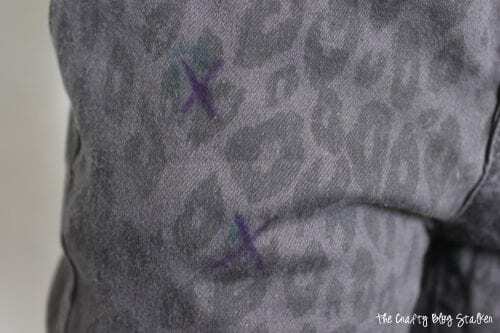 Turn the jeans right side out and with a seam ripper cut a hole within the square of where the bling patch is placed. Distress the edges by pulling on the raw edges. The holes will distress more when the pants are washed. These Blinged Jeans are so cute and Allie loves them too! Have you ever altered your clothes to make them fit your style? Share and leave a comment below! SAVE HOW TO BLING A PAIR OF JEANS TO YOUR FAVORITE DIY FASHION PINTEREST BOARD! Hi There, I like very,very,VERY much!! The possibilities are endless really!!! That’s a really cool idea! I was just complaining today about how sewing for Tweens is tough. The want everything glittery and sequeny which doesn’t tend to be real friendly with frequent washings. Then I find that most stuff is too babyish or too grown. So I love this idea so, so much! These turned out so fun!!! 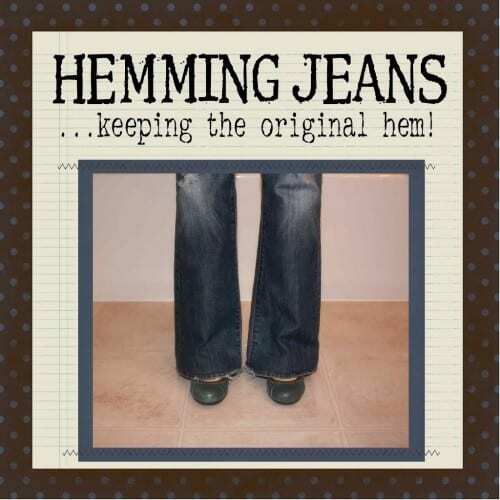 This would be perfect for patching those older jeans with worn out spots too!! I love it. I remember when I was young they had a thing called the bedazeler. Trims have come a long way since then. I love these jeans! You’re giving me ideas… the bling would also work great on jeans that already have holes in them! How nice. Amazing how simple but so effective,especially as they only cost $4. I recently visited St Vinnies,and they had a whole rack of jeans for $2each. I got 3 pairs and they look new. :)Might try this with one of them. Bling on a roll? How great is that?! This is adorable. Who wouldn’t love these? I’ll be featuring them this week. 🙂 Thanks for linking up to Crafty Tuesday. Oh what a fun idea!! My daughter is 11 and all about neon and bling!!! 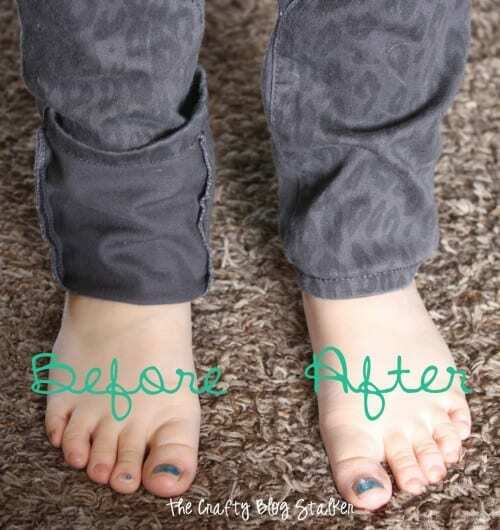 Those are awesome looking pants – the after is so much cooler than the before!! Thank you so much for sharing this super tutorial over on Tutorial Thursdays.